Season the pork tenderloin with salt and pepper and then slice into 1-inch thick medallions (rounds). Heat the olive oil in a large, heavy pan until it simmers. Then swirl the oil to distribute evenly. Working in batches of six slices at a time and without moving, sear the pork medallions until they are all browned on one side, about 80 seconds. Then turn the pork medallions with tongs and continue cooking them until they are browned on the other side, about 80 seconds. Transfer the pork medallions to a plate and cover with foil. Reduce the heat to medium, add shallots to the pan and sauté for about 1 minute, until translucent. Add the vinegar and cherries to the same pan, cooking for 2 to 3 minutes until the liquid is reduced to about 2 tablespoons and scraping browned bits from pan. Increase the heat from medium to high. Add the chicken stock, rosemary, and any accumulated meat juices to the pan, boiling until the liquid is slightly thickened, about 2 minutes. Season with salt and pepper, to taste. 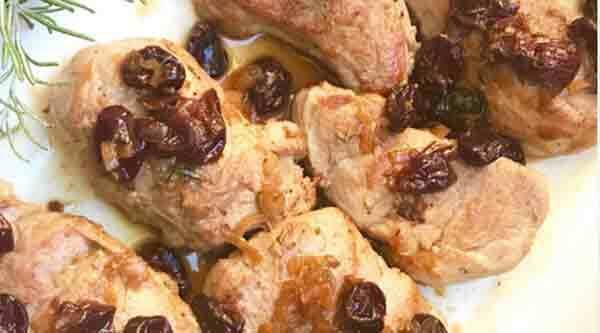 Reduce the heat to medium and return the pork medallions to the pan, turning to coat and spooning the cherry & rosemary sauce on top. Simmer to heat the pork through, and the flavors are thoroughly blended, about 3 minutes. Adjust the seasoning with salt and pepper, as needed. Transfer to a serving platter and spoon the sauce over meat; serve immediately.